Despite Moorlynch being rich in gardeners, none of us had managed to grow a pumpkin of significant size for a centrepiece for the Harvest Auction last night; the ones which Percy has been zealously guarding are also modest in size, and I am happy to keep them in any case, as they are just too tasty. So yesterday morning I set off determined deal with this pumpkin crisis and return with the biggest I could find. Deciding to stop in at the nice independent garden centre in preference to Salisbury’s – just in case – I was told, sorry, they didn’t have any. They had seen one however, just on the main road through a village not many miles away. It was on the roadside, acting as a ‘here be pumpkins’ sign. So I didn’t stop at Sainsbury’s but drove off into the drizzle on a pumpkin hunt. Suddenly there it was, a BEAST of a thing. Knocking on the door of the little farm shop I never knew existed, I found a charming elderly couple, and a lot more pumpkins, jars of things and other home-grown and home-made fare, all in their garage. The indoor pumpkins were smaller than their roadside kin, but some were still respectably hefty. I explained that I was on the hunt for a pumpkin for the aforementioned auction, and could I please have the biggest in the garage. The lady said would I like the one on the roadside? I goggled and said I would love it. How much? A fiver. I goggled some more and said was she sure? and made a note to buy things in jars also. Oh yes, she’d just get the lads to bring another one down from the fields. The lads, I imagine, are of the strapping variety. The only thing she wasn’t sure about was how I was going to pick it up, and she was afraid that she couldn’t help as she’d recently had a hip operation. They build them tough round here: she was probably pushing eighty but still felt she should apologise for her reduced pumpkin-hefting abilities. I went out to survey the problem. Her husband was sent out too, in his slippers and anorak, with a stern warning to watch that hernia. I imagine he was no younger that she was. A pumpkin, in the rain, is not an easy thing to pick up and I have to say the task would have been quite impossible had I not looked at the thing (having tried and failed to actually get it entirely off the ground) and thought there would be no way we’d ever pick it up without some kind of lifting straps, even if I went home for reinforcements. At which point I suddenly realized why I had been carrying a blanket round in the boot of my car for the last 10 years. It was not for the purpose of safely packing paintings, nor for the warming of stranded roadside people, it was a pumpkin sling. All these years and I never knew! At this point the rain decided we were getting too clever and decided to bucket down, but undeterred, and with me desperately trying to lift more pumpkin than my willing but quite possibly octogenarian assistant, we got the monster off the ground and into the car. The Harvest Auction was a great success. You couldn’t fail to notice that it was to be that day with the monstrous fruit sitting as an equally successful roadside sign outside our pub now. It took four of us to manoeuvre it into the pub, whence it sold in the auction no fewer than 4 times (nobody actually wanting to keep it) until finally it settled upon being owned by Lyndon. Lyndon is no weakling but proper Somerset farming stock, probably from the same heritage as the elderly lady who said she probably shouldn’t lift it after her hip operation. After several pints at the end of the evening he wandered over, picked it up all on his own and, pausing only to smack his head on the door on the way out, went off with it. And that is the last I saw of it. 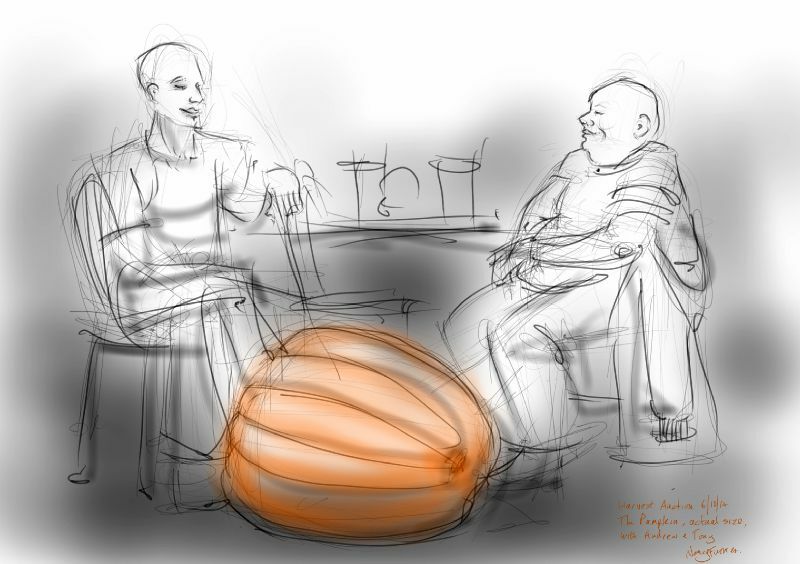 This entry was posted in Events, People, Plants and tagged art, drawing, events, fruit, harvest auction, people, plants, pumpkin, sketch, tablet sketch on October 7, 2014 by Nancy Farmer. Please don’t tell Lyndon I laughed about him smacking his head. I won’t Yvonne 😉 It’s ok, I think that Lyndon is indestructible!